As we have so many chestnuts falling from the trees, our children have found many ways to keep themselves occupied with them. The children have understood that the outside of the conkers have a prickly covering. We use sticks to open up the outer covering or stamp on them. Once the children find the conkers inside, they find different things they can do with them. They’ve taken part in counting activities and have role played using the conkers but in particular they’ve enjoyed peeling them! This is good practice for children’s fine motor development. On Wednesday morning we visited our garden plot for the first time. The staff at Chiswick House and Gardens have very kindly offered us an allotment to use for gardening. We will use this space every Wednesday morning and have received some suggestions from children of what they think we could plant first. This gives us a good opportunity to talk about harvest with the children. We’ll have to think of some things we can grow during this time of year, any suggestions? As you know one of our favourite things to do is to build dens. While some children were helping build dens, others were climbing them and some going to hide inside. 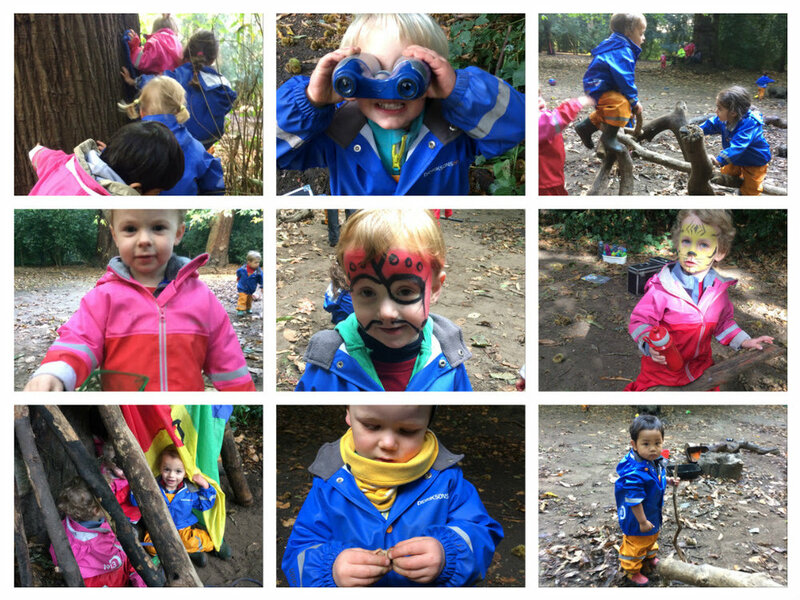 We played hide and seek and I think you can guess where the favourite hiding place was – the den. Some of the children liked to use the den as the ‘Dog Tent’. We helped the children tie logs to their ropes which they used as dogs. I’m taking my doggy for a walk now. Now he wants to sleep. I have to take him to the dog tent. With visiting the garden plot, we will be able to talk more about harvest time with the children. As Chiswick House and Gardens sell their crops, we will take the children to buy some vegetables. We’ve also ordered in some harvest crops (potatoes, onions, peas etc.) to look at with the children. After the children have had time to see, touch and smell these. They will then be able to taste them in a homemade soup. All parents and children are welcome. Please take responsibility of your children if they are not booked in for a session. Please make sure your children have fleeces in their bags as the weather gets unpredictably cold.